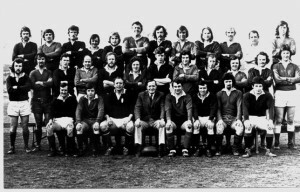 In the late 1960’s a group of Rugby enthusiasts got together to discuss the possibility of forming a Rugby Club in the quickly expanding town of Linlithgow. 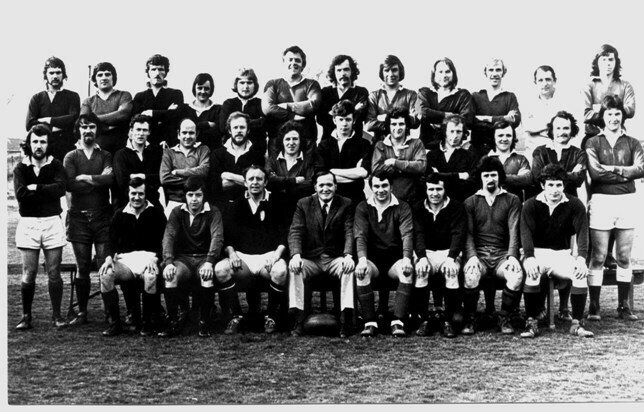 From this group emerged Linlithgow RFC as we now know it. However the original Linlithgow Rugby Football Club was formed on Wednesday 3rd May 1922 “at a well attended meeting of local enthusiasts in the Burgh Court Room”. Playing fields were a problem at that time as they are now and it was “remitted to the officials to endeavour to secure suitable playing fields in the vicinity”. The Club found a home at Boghall Park through the kindness of the owner, Mr William Wilson. The Club remained at Boghall through the six years of its activity (The cricket Club used the Peel) although the playing surface appeared to be a problem because at the Club’s AGM it was stated that the pitch was “in an unfavourable condition, being somewhat hard”. 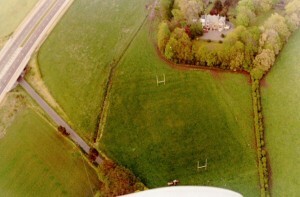 However it was at Boghall that the Rugby Club kicked off its first match on September 1923. The local Pipe Band played before hand and the Gazette reported, “The Lithca team, resplendent in their navy blue jerseys, and supported by their President and joint Vice Presidents, and all smiling their sweetest smiles for the benefit of generations yet unborn, posed gracefully for the camera man”. The Linlithgow team was: T. Kidd, W. Dougal, T.S. Roxburgh, I.Dobbie, J. Kidd, W.D. Arnott, J. Scott, A. Paterson, R.W. Brown, R. Dobbie, D. Thomas, E. Oliphant, C. Dickens, W. Addison and M. McLuckie; with the Club President Rev. Edgar Richards as referee. The opposition was Trinity Academicals, who won the match by twelve points to five. Linlithgow only had to wait a week to record their first victory, again played at Boghall, with a convincing 15 points to 3 win over United Collieries. Linlithgow also showed commendable sportsmanship on this occasion. The United Collieries team arrived two players short (having missed their train) but Linlithgow evened the two teams by giving one of their players. The Team once established maintained a good record. In season 1924/25 they played 18 games winning ten, losing 6 and drawing 2. The following season they played 11, won 7 with 2 lost and 2 drawn. In November 1926 a former Linlithgow player, R.M. Finlay, then at St Andrews University, took part in the Scottish International Trial. Sustaining a level of involvement for what was then a new sport in the area, proved difficult and at the AGM in April 1927 the President, Councillor Tulloch, commented on “the precarious state of the Club and the lack of public support”. Despite the problems, the Club played out the 1927/28 season and the last game that can be traced was against Edinburgh Borderers at Boghall on the 24th March 1928. The team selected for game, as printed in the Gazette indicates the Club’s problems, and was: G.K. Johnston, J.B. Dymock, M.B. Dickson, J.D. McIntosh, A.N. Other, J.Marr, H. Horne, W. Fair, W. Dickson, A. McGregor, W.R. Main, W.F. Buchanan, J. Tant, A. Fair, and A.N. Other. There was no record of the score. After this the Club appears to be have become dormant, that is until 1970 when a meeting of local enthusiasts resurrected Rugby in Linlithgow. The new Linlithgow Club of the 1970’s played their first matches at Bridgend before moving to Boghall, ironically back to their original base in the 1920’s and now the home of West Lothian Cricket Association. After a few years sharing the facilities of W.L.C.C. they moved from one local hostelry to another before settling down at the St. Michaels Hotel, playing home matches at Springfield Farm or as it became know “The Cow Pat”. Cow Park or Cow Pat? 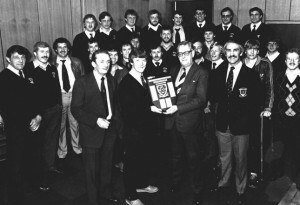 By 1980 the Club had grown to such an extent that five teams were being fielded yet Linlithgow R.F.C. still did not have a permanent home. However a couple of years of “Blood, sweat and Tears” later, we had arrived! Mains Park was the permanent base of the club complete with our grand Clubhouse and pitch. The early years of the Club had been played in the Edinburgh & District League with a lot of enjoyment but little real success. It was only after the reconstruction of the National Leagues at the end of 1981/82 season that success arrived. In the first season of National Rugby, Linlithgow won division seven to gain promotion. The following season, while playing some of their most attractive Rugby, they just missed out on promotion, finishing third in division six. Season 1984/5 saw Linlithgow climb to division 5. After a few seasons in division five, season 1987/8 saw promotion to division four, again as champions. Season 1992/3 was a very disappointing one which saw the club relegated for the first time in their history. However we came right back the following year finishing third in division five in one of the most exciting finishes to a league. We were voted club of the month in October 1993. While over the last few seasons we have appeared to be stuck about 45/50th in overall Scottish Rugby Clubs the facilities have been improved in several innovative ways. 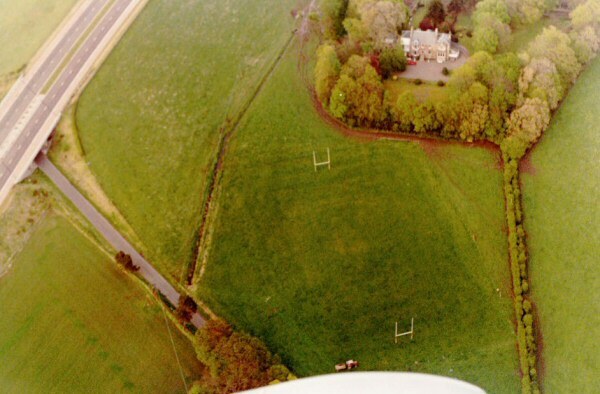 In 1992 we were rewarded with the acquisition of a second pitch at Mains Park. The lower pitch had been a soccer pitch but with the creation of the Kettilstoun Sports facility, soccer transferred to the new area leaving the Rugby Club with two pitches. Within two years an extension was added to the Clubhouse extending the changing facilities to allow for the second pitch. The lounge area was extended and improved catering facilities added. By start of season 1996/7, full playing lights had been added to the lower pitch giving the Club one of the best floodlit pitches in Scotland. This may have helped in the next re-awakening of the Club, for over the next 4 seasons players, officials and supporters alike enjoyed success. The Club finished third in National League Division 3 in 96/97 and the following season began with the first tentative steps towards paying players. Prop John Gibson and Scrum Half Kenny Harper joined as ‘player/coaches’ having recently won the Scottish Club Championship with Stirling County. An incentive scheme rewarded players for training and in addition First XV players were rewarded for winning! Points were awarded to players and these were cashed in for kit. Season 97/98 was a truly memorable season. It was clear from the start of the season that Ross High FP, newly promoted from National 4 was the team to beat. When the final game of the season arrived, it was the showdown between the Reds and Ross High at Mains Park. What should have been a nail-biting Championship decider turned out to be a rout for the Reds, who were crowned Division 3 Champions. The Club was now one of the top 50 Clubs in Scotland. In 1998, the club achieved its highest ever success to date when the u14s won the Scottish Schools’ S2 Cup at Murrayfield, beating Dundee High School, George Watsons’ College and Huchesons’ Grammar School in the quarter-final, semi-final and final respectively. Linlithgow S2 Team (1998) – Scottish Schools’ Champions! Season 98/99 began poorly, but the introduction of a South African stand-off boosted the playing strength and performances picked up. In fact some performances were outstanding, particularly the defeat of Premier League 1 side Stirling County in the Third Round of the Scottish Cup at Mains Park – certainly one of the greatest ever performances from a Linlithgow side. The Cup run was only halted at Langholm, when the Reds were very unlucky to lose with Gala awaiting the winners in the Quarter Finals. The next season 1999/2000 saw the Club draw Melrose in the Cup Third round, but there was no happy ending at Mains Park this time. However League form was good and had it not been for the loss of both Tongans before the end of the season, promotion could have been achieved. 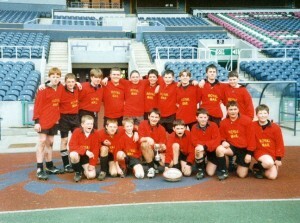 2000/2001 took the Reds back to Murrayfield in April to contest the Final of the National Bowl Competition. On the national stadium pitch the team had to settle for second best to a strongMurrayfield Wanderers XV, but what a great day out for the supporters! Fortunes took a dip after this. Some senior players retired and replacements were hard to find. The decline in fortunes resulted in relegation from National League 2 at the end of 2001/2002. And so it was back to rebuilding. Since then, with the restructuring of the leagues, the club regained its position in National League 2 and for the seasons 2004/5 and 2005/6 finished mid-table, showing great ability in some games but inconsistency in others. This mixed performance continued for seasons 2006/7 and 2007/8, but in season 2008/9 it all changed when the club enjoyed its best ever league season, gaining promotion to National 1 and finishing second in National 2 with 87 points and winning 20 matches out of 22. The league winners, Whitecraigs, were beaten in the away match, but shaded the Reds 9-11 in the home tie. The only other defeat came away at Hawick YM – a team that finished third and missed out on promotion despite winning 19 out of 22 matches! 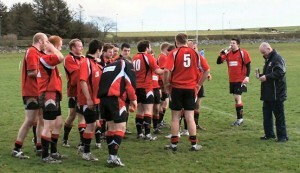 Squad celebrating promotion to National 1 after an away win at Caithness. The superb season’s rugby spilled into the Scottish Cup and Shield matches, with Premier 1 teams Boroughmuir and Glasgow Hawks being welcomed to Mains Park. The Reds scored 26 points against Boroughmuir and held the Hawks for most of the match before losing out 5-24 giving as good as they got for most of the match. All-in-all the Reds won 24 out of 28 senior matchesthat season, largely with a side based on youth development, progression and retention. Indeed the team that won away against the eventual champions, Whitecraigs, contained 16 players (out of the squad of 18) who had started their rugby as Minis at Linlithgow! The following season saw the Reds playing at their highest ever level in Scottish Rugby and, despite a barrel load of injuries during the season, they finished 4th with 60 points, putting them as the 40th placed team in Scotland! Seasons 2010/11 and 2011/12 saw the Reds slip slightly down the league, while still staying out of the relegation zone. At times it was nerve-wracking and the long league season (22 matches) took its toll from the young squad. The leagues were restructured in time for the start of the 2012/13 season, with a Premier league of 10 and a National league of 10, combining with two parallel 10 team Championship leagues effectively replacing the old 12 team Premier 1, 2 and 3 leagues. Below this level the leagues were regionalised to reduce travel and Linlithgow, along with the lower 8 clubs in National 1 from 2011/12, found themselves going regional! 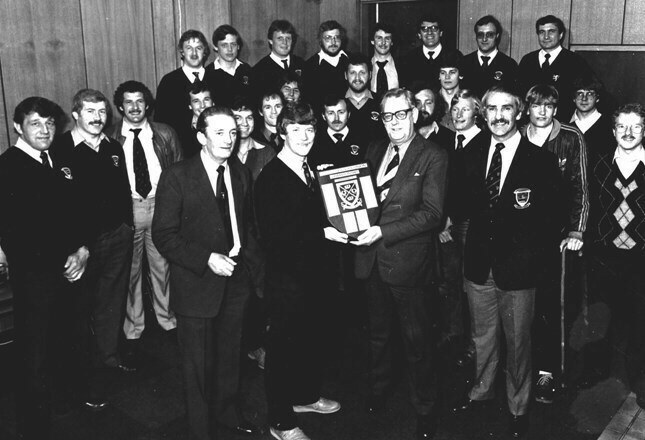 The RBS East 1 League though was very competitive, with many old adversaries – Duns, Berwick, Langholm, RHC Cougars, Livingston, Preston Lodge, Portobello, North Berwick and Dunbar. The Club has always maintained excellent working relations with the local school – Linlithgow Academy and is accepted in Scotland as being at the leading edge when it come to forging links with the local School and community. The club provide over twenty qualified coaches to cover age group Rugby in the Town. Please note: we have given you a part of the Club’s history, but that is not the most important thing to Linlithgow players, officials and members. The future is what matters to us and we are keen to see our Club progress both on and off the Park!